Had a chance to bug out from work early Friday .. did a little hog hunting and thought you guys might like to see what happened! One interesting note- only ONE drop of blood, smeared on a stalk of river cane was all the blood we got- stumbled up on the pig dead..but no blood trail...just the one spot and the arrow a little further in along the pig path was it. Amazing. This was about 1 1/2 hours south of me, near Perry GA in Macon County. I'm the worlds worst when it comes to guessing right on hogs...but after this one was field dressed we took a " W A G " at it and figured it was around 150 maybe...I'm not sure. 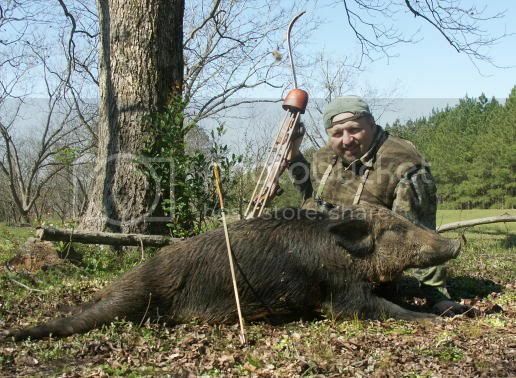 In that area they have legitimate 400+ pounders and they are mean looking hogs when they get that big!!! A good meat hog ... anything I take with a bow(all I hunt with) is a "trophy" for me, though! It was a great hunt with lots of action. Saw several others - think the cold snap we had this weekend really got 'em moving around! Isnt that just a NASTY lookin' hog??? Came ambling up the trail and stopped about 18 yards out and gave me a look like I was long overdue paying back a loan- then turned broadside for a better look- but the grizzly 160 was just too much to handle! interesting signature. Do you play the harp? No Ray, Im not the musical type...it's latin for "The Forest Calls"